About few months ago I went to spotlight Singapore on my way back to Chiang Mai. 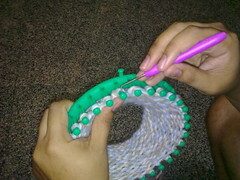 I saw this loom knitting set but I still hesitated to buy it. I donâ€™t think I really want this tools. The price is quite cheaper compared to the price on Amazon. A few weeks after I arrived in Chiang Mai, I started to regret my decision not buying the looms. I asked my dear cousin who live in Singapore to help me to buy the looms. On beginning of this month finally these looms arrived at my home *yay*. My cousin said I donâ€™t have to pay for the looms, she wanted to give it to me as my birthday gift (my bday was on October). I am so happy and I started the first project immediately. 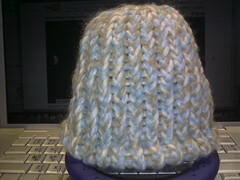 I made a baby hat that night. I followed the video tutorial I found on YouTube. I embed the video here. This is not my tutorial, I just embed to share it with you guys. 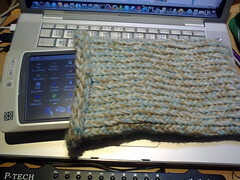 While Joe were making his loom project, I started another project. I made something flat using loom. 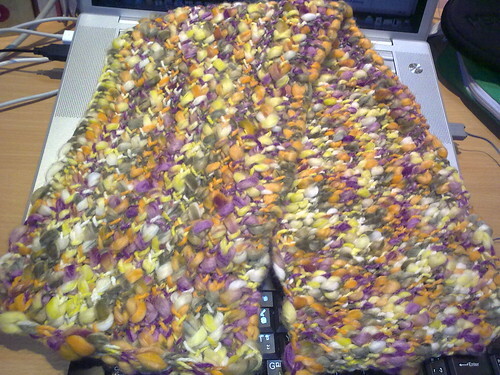 This is not as fast as baby hat or gadget bag, but this is absolutely faster than knitting with the needles. I am not good in knitting. I always experience drop stitches and struggle to fixed it and get frustrated most of the time with the drop stitches. mbak ini berapa harga nya 1 set? Could u pls tell me the price of loom set in SG? 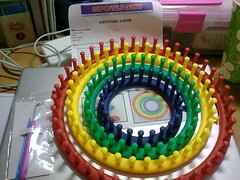 I just got a set of circular looms from Spotlight Singapore (3 days ago), they were $19.90. Hi, this set of knitting loom is currently $19.95 at Spotlight, Singapore.